Jet is a product of high-pressure decomposition of wood from millions of years ago, commonly the wood of trees of the family Araucariaceae. Jet is found in two forms, hard and soft. Hard jet is the result of the carbon compression and salt water; soft jet is the result of the carbon compression and fresh water. Jet has been used in Britain since the Neolithic period, but the earliest known object is a 10,000 BC model of a botfly larva, from Baden-Württemberg, Germany. It continued in use in Britain through the Bronze Age where it was used for necklace beads. During the Iron Age jet went out of fashion until the early third century AD in Roman Britain. The End of Roman Britain marked the end of jet's ancient popularity until, despite sporadic use in the Anglo-Saxon and Viking periods, the later Medieval period. Jet saw a massive resurgence during the Victorian era. Whitby jet was a popular material for jewellery in Roman Britain from the third century onward. It was used in rings, hair pins, beads, bracelets, bangles, necklaces and pendants; many of which are visible in the Yorkshire Museum. There is no evidence for Roman jet working in Whitby itself, rather it was transferred to Eboracum (modern York) where considerable evidence for jet production has been found. The collection of jet at this time was based on beachcombing rather than quarrying. In the Roman period it saw use as a magical material, frequently used in amulets and pendants because of its supposed protective qualities and ability to deflect the gaze of the evil eye. Pliny the Elder suggests that "the kindling of jet drives off snakes and relieves suffocation of the uterus. Its fumes detect attempts to stimulate a disabling illness or a state of virginity." and has been referenced by other Ancient writers including Solinus and Galen. 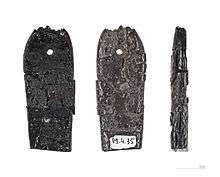 Jet objects were exported from Eboracum all over Roman Britain and into Europe. Around the Rhine some jet bracelets from the period have been found that feature grooves with gold inserts. 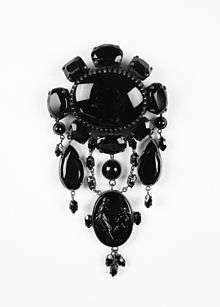 Jet as a gemstone was fashionable during the reign of Queen Victoria, during which the Queen wore Whitby jet as part of her mourning dress, mourning the death of Prince Albert. Jet was associated with mourning jewellery in the 19th century because of its sombre colour and modest appearance, and it has been traditionally fashioned into rosaries for monks. In some jewellery designs of the period jet was combined with cut steel. In the United States, long necklaces of jet beads were very popular during the Roaring Twenties, when women and young flappers would wear multiple strands of jet beads stretching from the neckline to the waistline. In these necklaces, the jet was strung using heavy cotton thread; small knots were made on either side of each bead to keep the beads spaced evenly, much in the same way that fine pearl necklaces are made. Jet has also been known as black amber, as it may induce an electric charge like that of amber when rubbed. Latticework San Miguel de Lillo, Asturias, Asturian jet of Oles, Villaviciosa. Jet is very easy to carve but it is difficult to create fine details without breaking so it takes an experienced lapidary to execute more elaborate carvings. Jet has a Mohs hardness ranging between 2.5 and 4 and a specific gravity of 1.30 to 1.34. The refractive index of jet is approximately 1.66. The touch of a red-hot needle should cause jet to emit an odour similar to coal. Although now much less popular than in the past, authentic jet jewels are valued by collectors. Unlike black glass, which is cool to the touch, jet is not cool, due to its lower thermal conductivity. Glass was used as a jet substitute during the peak of jet's popularity. When it was used in this way it was known as French jet or Vauxhall glass. Ebonite was also used as a jet substitute and initially looks very similar to jet but it fades over time. In some cases jet offcuts were mixed with glue and molded into jewellery. Anthracite (hard coal) is superficially similar to fine jet, and has been used to imitate it. This imitation are not always easy to distinguish from real jet. When rubbed against unglazed porcelain, true jet will leave a chocolate brown streak. The microstructure of jet, which strongly resembles the original wood, can be seen under 120× or greater magnification. ↑ Neuendorf, K.K.E. ; Mehl, Jr., J.P.; Jackson, J.A. (editors) (2005). Glossary of Geology (5th edition). Alexandria, Virginia: American Geological Institute. p. 344. ↑ "Jurassic timescale". Retrieved 2010-06-23. ↑ "Venus figures from Petersfels". Retrieved 9 August 2016. ↑ Caius Julius Solinus (2013). "DE MIRABILIBUS MUNDI CAPITULA VII - XXIV". Retrieved 2013-10-31. ↑ Johns, Catherine (1996). The Jewellery of Roman Britain Celtic and classical Traditions. Routledge. pp. 120–121. ISBN 9780415516129. ↑ Phillips, Clare (1996). Jewelry from Antiquity to the Present. Thames and Hudson. pp. 148–150. ISBN 0500202877. ↑ Clifford, Anne (1971). Cut-Steel and Berlin Iron Jewellery. Adams & Dart. pp. 21–22. ISBN 9780239000699. 1 2 "Jet necklace and black silk tie". Body arts. Pitt Rivers Museum. 2011. Retrieved 9 February 2016. 1 2 "Tiara". V&A Collections. Victoria and Albert Museum. Retrieved 9 February 2016. 1 2 Phillips, Clare (1996). Jewelry from Antiquity to the Present. Thames and Hudson. p. 150. ISBN 0500202877. Wikimedia Commons has media related to Jet (lignite).